A lot is at stake when you dive into organic SEO. 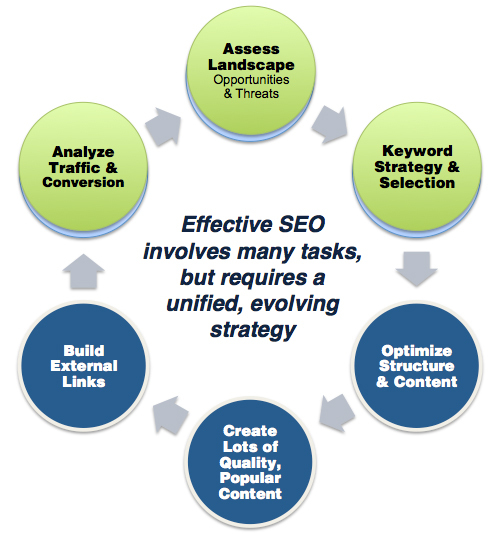 For one thing, an SEO strategy is dynamic and constantly evolving. Google, your customer and your competition are changing daily, so to stay in the race SEO demands a perpetual uphill battle (even for those holding #1 rankings). Perhaps just as important, SEO tactics carry long-term consequences. When it comes to positioning your site’s organic SEO strategy around a certain set of keywords and phrases, each step of progress will impact your site months down the road. If the impact is negative, immediate remedies will still take months to take effect, and even then you may have done some difficult to repair damage. For several weeks I have been thinking to myself – “What can be done for the SEO marketer? Is there a way to take low-risk non-committal steps towards changing and developing your SEO positioning?” Then it dawned on me that maybe paid searches have redeeming value for all websites. Why not use paid search campaigns to test similar keywords and phrases against each other and against existing site keywords/phrases to determine the relative and absolute winners (or losers)? The winners then inform the organic SEO strategy – how the website content, link structure, meta data etc. evolve to support these new keywords/phrases. AdWords are relatively “non-binding” in terms of how closely Google associates paid search words with your site. Also, AdWords don’t cost as much and can provide very immediate and meausurable results. This is a perfect sandbox for organic SEO marketers! Then I came across Aaron Wall’s post on SEObook that basically made this exact suggestion and articulated how it is done. I just wanted to share it in the event that some frustrated SEM marketers are looking for a more significant role in the organic side of SEO. Perhaps I am alone in downplaying the universal value of SEM for all businesses. But personally, I have seen really solid SEM campaigns fail for companies strictly because it doesn’t fit their industry and product. Also, the temporary “bump” in traffic hasn’t shown to significantly improve site ranking. Using AdWords as a brand awareness tool just seems a little silly to me – like saying a telemarketer is positively contributing to “brand awareness” even if the individuals receiving the calls are angry or indifferent when they receive a call. Using AdWords campaigns to test into an organic SEO strategy and continue to evolve it is something any company can benefit from trying. For marketers of any sort, this is a good lesson in making both cautious AND aggressive steps in maintaining and developing market position. It takes the weakness of paid searches and uses it as a strength to serve a weakness of organic SEO. SEO is often veiled behind abstract concepts, web 2.0 lingo, and apparent structural complexity. All of these are realities, but I think at the end of any conversation on SEO it is important to remind ourselves that there is a common thread behind every SEO tactic and every variable evaluated by Google algorithms: How credible and relevant is the content on your site and how easy is it for users to get what they want on it? I have heard many marketers use the complexity of SEO as a way of mystifying prospective clients, wooing them with big words and ideas. Just do a Google search for “SEO strategy” and read any blog that comes up. You’ll see what I mean I am sure. But honest online marketers will you that SEO is not rocket science. It is possible to discuss and achieve an intuitive grasp of SEO theory and practice even if you have never looked at html in your life. The apparent complexity of SEO is simplified by a very simple concept: user experience. Excellent SEO requires marketers, together with developers and front-end designers, to think deeply and strategically about user experience. Algorithms don’t just look at H1 tags and alt tags anymore. They are getting better and better at identifying themes across content on sites that they look for not only in isolated pages, but even in the site structure. Picture yourself in the shoes of a user who comes to an e-commerce site and looks straightaway at the site map. Now what questions would you naturally start to ask yourself, however subconsciously? What are the different product categories this site offers? How are they arranged and presented within the site navigation and structure? Looking at the site navigation and structure, how do these categories seem fit together under a common theme? Is this a consumer electronics site or more of a home appliance site? How does my experience of this site, as I dig deeper into it, help me move naturally and seamlessly throughout the site, so I don’t have to use the “back” button in my browser, bread crumbs, top menu nav or site map? Am I able to scan a page and have naturally placed “landing spots” to catch my attention with something relevant and interesting if I get lost or lose interest? On one level, these questions are obviously reducible to usability principles for web design. Questions that every designer should be asking in the first place. But these are also extremely relevant to internal link structure, a factor increasingly important for Google algorithms. Many speak as if Google’s algorithms were completely incomprehensible divine mandates we must blindly follow – “You just put keywords near the top of the page cause that’s the way Google likes it.” This is to completely overlook the purpose of Search Engine Optimization. It is not just to get visitors to your site, it is to get the right users to your site. It is not just about getting users to navigate around your site and spend time there, it is to give them a positive, seamless experience demonstrated in increased conversion rates and revenue. To get a grasp on SEO, it is crucial to leave behind the superstitious religion of our SEO forefathers and get in step with what Google is really doing – getting better and better at helping people use the internet. Google is not interested in your business, they are interested in your customer. If you can’t help the customer, sooner or later Google will probably notice and dock you for it. This doesn’t just mean the “black hat” techniques designed to trick people into visiting a site, but also the clumsy, confusing and frustrating aspects of website content and navigation. It is true, a web usability professional can evaluate user experience better than a web crawler… at this point in time. But people are creating the algorithms, which means they will become increasingly keen to bad user experiences. I’m not suggesting we don’t try to understand nuances involved in algorithms. I’m just making the point that we can lose perspective if we make our focus the algorithms instead of the customer experience. There is common sense and intelligible purpose behind SEO. User experience is the glue that ties together the diverse variables involved in SEO, and if you get user experience right, you are bound to take huge strides towards Search Engine Optimization.